If you are an Apple Safari web browser user and using Safari as a primary Web Browser on your iPhone, iPad and iPod devices than you will be pleased to know that there's is a tweak which helps you to Save and Open Safari Webpages as PDF Files in iPhone, iPad and iPod and also helps you to Save and Upload Safari Webpage PDF Files to Dropbox and iFile at Free of Cost. This tweak will helps those Safari browser users who frequently save webpages and web articles in Safari browser in iPhone, iPad, iPod and wants to open and read that webpages in Personal Computers, Dropbox or iFile accounts without having an internet connection. Sometimes internet connection is required to open and read Safari Webpages but with PDF Files Format you don’t need to have an internet on your iPhone, iPad and iPod and you can even Save and Upload Safari's Webpage PDF File to Dropbox and iFile Account at Free of Cost in offline mode and later you can read your PDF File format on your Mobile phone and PC. So let’s start the Tutorial and Guide on How to Save and Open Safari Webpages as PDF Files format in iPhone, iPad, iPod and Upload to Dropbox and iFile Account at Free of Cost without internet connection in offline mode. In our first tutorial method we will try to Save Safari Webpages as PDF Files in iPhone, iPad and iPod and then we will guide you on how to Save and Upload Safari Webpages PDF File into Dropbox and iFile Account at Free of Cost without having an internet connection in offline mode. After saving Safari webpages as PDF Files in iPhone, iPad, and iPod you can also Save and Upload PDF Files into Dropbox and iFile Account, after that you can access, open and read respective PDF Files on your other personal computers through Dropbox or iFile account support. This tweak doesn't need any third-party iOS Apps installation and it’s also doesn't required any internet connection. Now follow our Tutorial and Guide below. How to Save and Open Safari Webpages as PDF Files in iPhone, iPad and iPod for Free? Step 1: First open "Safari Web Browser" on your iPhone, iPad and iPod and navigate to your respective "Webpage or Website". 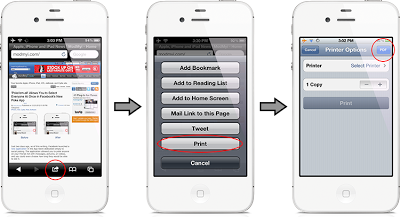 Step 2: Now Click on the "Share" Button (Available in Arrow Shape) from the Safari Menu below. 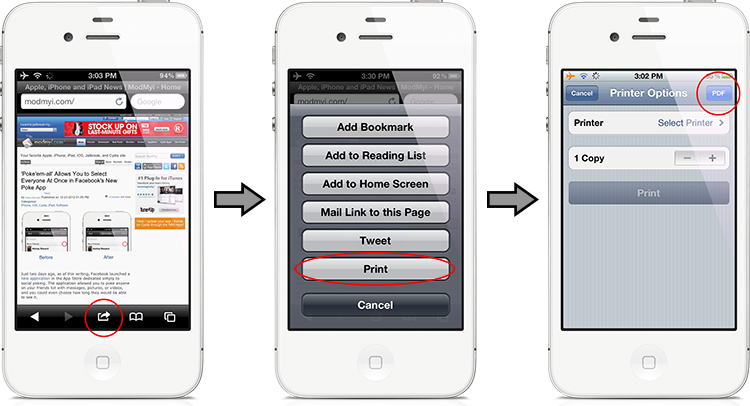 Step 3: After that, Click on the "Print" Button from the Menu. Step 4: Now Click on "PDF" Button on upper right side to Save the webpage in "PDF File Format". Step 5: Your Safari Webpage has been saved into PDF format, now you can open it from your desired folder. You're Done!! 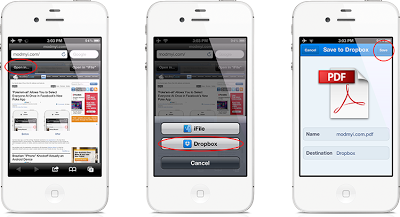 How to Save and Upload Safari Webpage PDF Files to Dropbox and iFile Account for Free? Step 1: After saving your Safari Webpage as PDF File format in iPhone, iPad and iPod, you can now open and view it in Dropbox or iFile Account. First Click on "Open in... " in the upper left corner of your Safari Web browser. Step 2: Now Select the "Dropbox or iFile" option from Menu and Click on it. Step 3: After that, Click on "Save" Button on upper right corner to Save and Upload the PDF file in Dropbox and iFile account. Step 4: Now you can open, view and read "Safari Webpage PDF Files" from your personal computers through Dropbox and iFile Account for Free without having an internet connection. You're Done! !